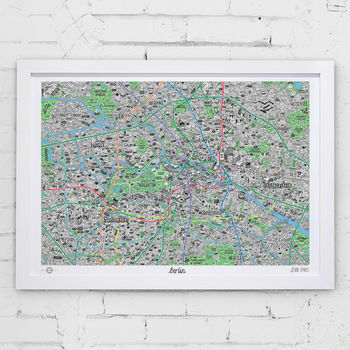 Hand-drawn map of Berlin by Jenni Sparks. 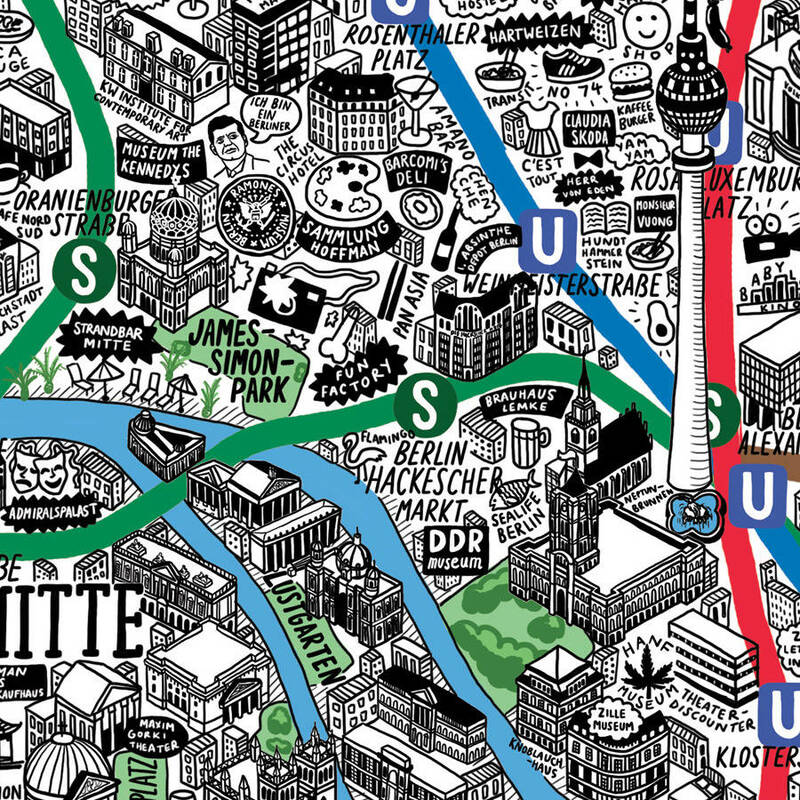 Jenni Sparks has collaborated with Evermade to create the definitive culture map of Berlin. Jenni Sparks has now moved her talents to the diverse cultural landscape of Berlin. This intricate hand drawn map features hundreds of well-researched quirky facts, landmarks, bars restaurants and local knowledge. 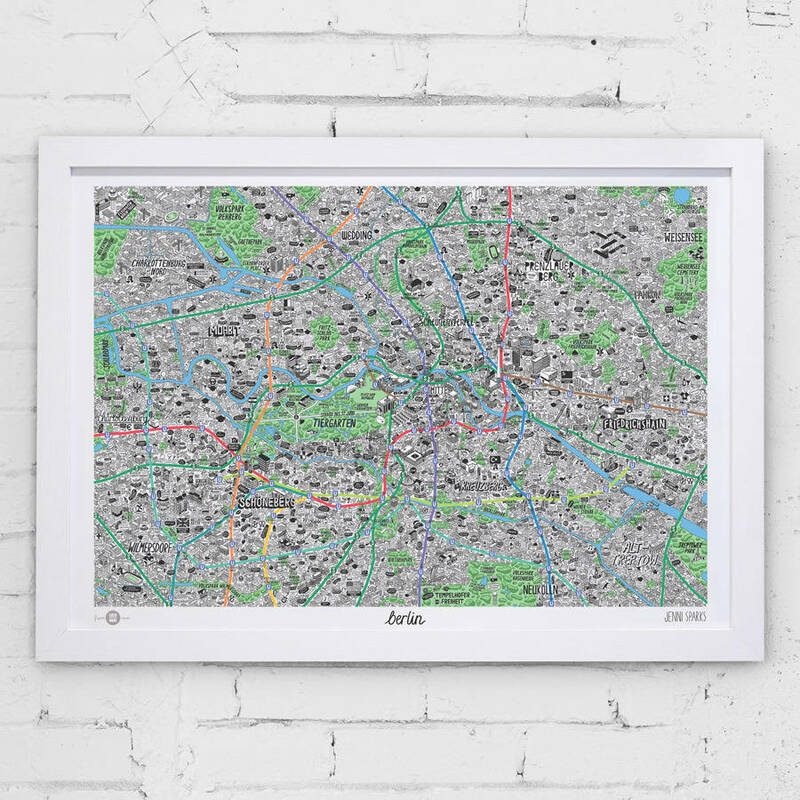 Covering everything from bahnhofs to Berghain, Jenni’s intricate, hand-drawn map shows both the local and the more well-known sides of this vibrant European capital. 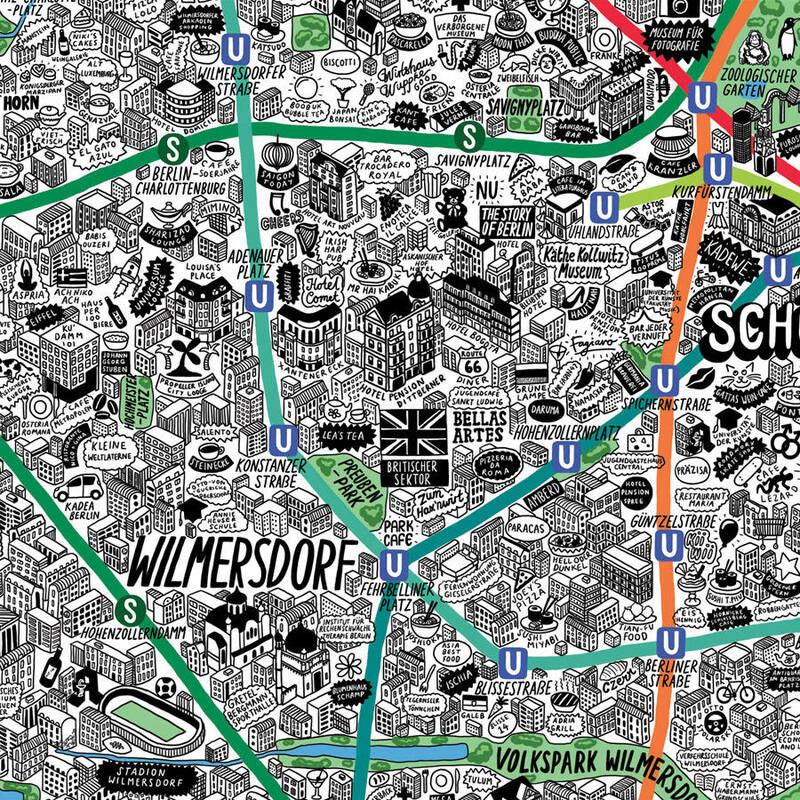 The map covers the areas of Berlin that you’d expect; it goes as far north as Wedding and Volkspark Rehberg. The south covers all areas up to and including Viktoriapark, Treptower Park and Wilmersdorf. The east of the map goes as far as Friedrichshain, Pankow and Weisensee. 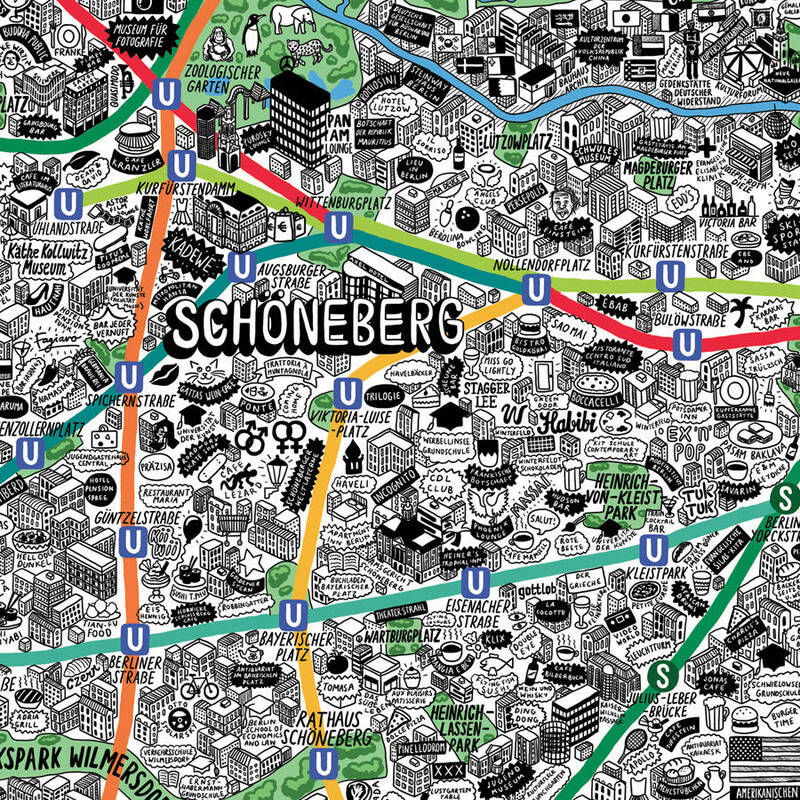 The most western parts of the map are Charlottenburg Nord, Flughafen Berlin Tegel and Charlottenburg. Of course, it also covers Tiergarten, Mitte, Moabit, Schöneberg and Kreuzberg. Available in two standard sizes for easy framing; A1 and A2. We can also frame your print for you before we dispatch and courier it to you (please allow a few days for you picture to be framed, we typically take 2-3 working days before dispatch, but this may take longer during busy times). Framed in a wooden frame (4.0cm wide x 3.7cm deep) painted with either white wash or black stain finish. Glazed with a crystal clear shatter resistant acrylic (PMMA) for safety. Framed in a wooden frame (1.9cm wide x 2.8cm deep) painted with either white wash or black stain finish. High quality print on 300gsm woven brilliant white matt paper.